What would be a good costume for me? I'm 5 foot 1 inch, aboout 115 pounds, brown hair and blue eyes. Since you don't give me any information about your personality, dance style, or tastes, I'm only slightly less clueless than you. But I see that you're close to my size — very short and of medium or sturdy build, neither tiny nor chunky. So any of the costumes in my photo gallery would probably be flattering on you. Click on the photo to the right to see the costume in more detail. Since first grade I've been the shrimp in the front row. I feel I should've been statuesque. One of my priorities when I design a costume is creating the illusion of more height, or at least not emphasizing the lack of it. I've addressed this issue in my answers to the 95-pound dancer and the short pear-shaped dancer and apple-shaped dancers, but they bear repeating if you're well-proportioned, but concerned about appearing short onstage. You want to keep the eyes of the audience high, away from the floor and your feet and lower body. You want to keep your silhouette simple and narrow, with small, elegant details and important center motifs. Make your head attention-getting with ornamented headbands or scarves and jewelry. A bare costume is fine, as is a sheath or fitted beledi dress, like the one pictured in the column on stretch marks. Consider a shoe with a heel of a few inches, if it suits your style. Some super-duper hair mousse gives me an extra half inch on my head (every bit helps). Ask The Costume Goddess: Small Hips. Some suggestions to flatter your narrow hips. Ask The Costume Goddess: Pear-Shaped Dancer. Advice for both short and tall pear-shaped dancers. Ask The Costume Goddess: Apple-Shaped Dancer. Help for dancers who are short and apple-shaped. Ask The Costume Goddess: Thin Dancer. Flattering looks to go from skinny to slinky. Ask The Costume Goddess: Creating Cleavage. Ways to make the most of your assets on top. 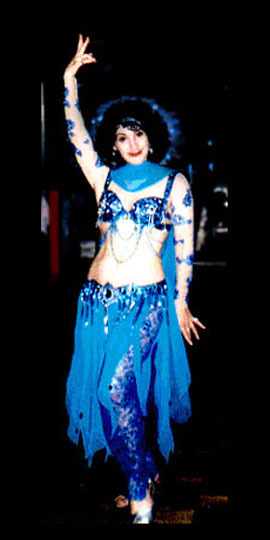 Ask The Costume Goddess: Baladi Dress. A costume style that can create the illusion of height.